I know, it's been awhile since I posted. I have no followers and was feeling like "why bother?" But I kinda missed blogging, even if I am the only one reading it. My horse show was rescheduled for May 11th. I just took Poppy and did the highs at 3'6. She was a superstar. We had a rail in the speed class but of no fault to either one of us. I really felt like she was tired. But rails make her mad so she kicked it into gear and jumped her toosh off the rest of the course. I just LOVE that mare. She loves to jump and it is so fun to ride her. Due to the rain and being busy it was about 2 weeks since I had been on Ketel. I spent a few days last week lunging him. He has gotten better at the trot but still bucks at the canter. I feel like it is just him playing and also his annoyance with me popping the lunge whip to make him go. I have to keep reminding myself that he is less than 3 months out of race training and just turned 3 so he this normal. On Saturday I decided to change things up. I changed his bit to the one I tried with Poppy. It is a double jointed loose ring with a ball in the center. I also put on the largest spurs I own. I struggle to keep him going and move off my leg but have avoided using spurs because I worried it would make him grumpy or sour. I took a friend's advice who had tons of experience breaking and training greenies (he's the one people are talking about when they say "send him to the cowboy") and put on the spurs. Big surpise, Ketel moved off my leg and didn't bat an eye. He kicked out once at the canter. It wasn't anything bad more like a "stop spuring me, I'll canter geez." I rode him again on Monday and he is really improving on his balance and moving into a frame (almost). He accepts contact willingly but without leaning on me. We also practice some leg yielding which he did well at. Wow did we have ALOT of rain over the weekend. It started on Thursday and rained nonstop through late Saturday night. We got 12 inches of rain over night on Thursday. So I woke up Friday morning to 3 inches of water in my feed/tack room, drenched stalls (the sideways rain came in through their windows), standing water everywhere around the yard, jumps floating...you get the point. I had taken Friday off from work Friday to go horse show so thankfully I was wasn't in a hurry to rush off to work. It took me almost all morning to get the wet stalls stripped and cleaned. The stalls on the west side of the barn were fine, just the east side were wet. So after I finished that I immediately called my husband and asked him to find someone that can build me some doors for the windows. 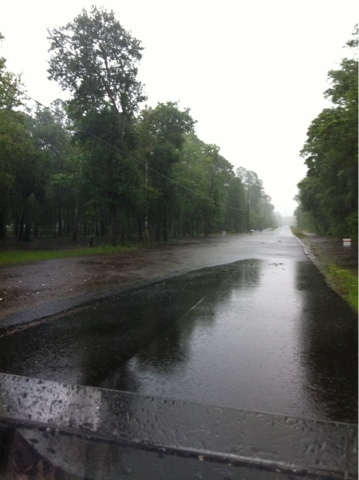 Soooo, the horse show was cancelled, every thing around here was under water. I was relieved, I did not want to be driving anywhere in this stuff. The poor horses were stalled from Thursday morning until Sunday evening. They have never been in that long. All I could do was hand walk them. Surprisingly they all handled it pretty well. Poppy was definitely going stir crazy. She is very laid back and not spooky however being inside that long she was spooking, antsy, and just bratty. Who could blame her though? I'm not sure who was more happy when I turned them out Sunday evening, me or them. Probably them but yay for not having to clean stalls twice a day anymore. The show has been rescheduled for this Saturday but I am not sure if I will go. My jump field is still really soggy, the downfall of jumping on grass. I have a few days to decide though. 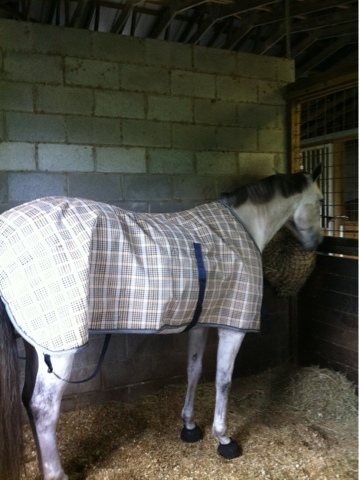 On a more exciting note Poppy's new Baker Fly sheet arrived Saturday. I wanted to share how pretty it is! I got a good ride in on Poppy yesterday before the rain came. I am still trying out the new bit I bought her and decided it's not working. It is a loose ring, 3 jointed, and has a ball in the middle. It reminded me of a Waterford which she likes so I gave it a whirl. I feel like I am riding her in a hackamore with this bit. In it she is hard mouthed, pulls, and ignores any half halting etc. Sooooo today I tried a slow twist. It's a bit different than the one I've tried before with her. It's a bit more narrow. We just hacked today but she did well with it. I worked on cantering small circles with her today. This helps with tighter turning in jump offs. She can over bend and lose momentum so we worked in keeping the circle tight with enough outside leg to keep her from bowing and maintain forward momentum. She did awesome. I finally got to ride Tank. 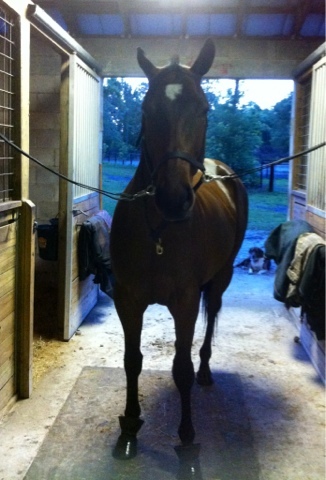 I felt bad, just as I pulled him out to ride him last night it started raining. He was a really good boy. I popped him over a few jumps and he was so good. I'm hoping to ride Ketel tomorrow. I just pulled him out to brush tonight. He has gotten so much better about standing in the cross ties. He stands quietly now and doesn't paw. I am trying to curry him daily to get his coat back. He is going through the let down phase from the track. So his body is adjusting to the change in diet and not galloping 2 miles a day 6 days a week. So he's in the ugly duckling phase, if you will. But I think he's still adorable.